The multi-million-dollar, multi-year undertaking will impact and enhance all aspects of the guest experience for the highly awarded small ship cruise line’s three Star Class vessels. 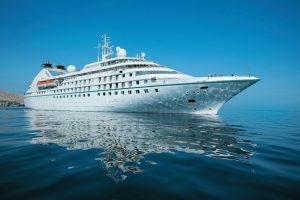 “We are thrilled to announce the $250 Million Star Plus Initiative, a significant investment in the future of Windstar Cruises,” said Windstar President, John Delaney. “This exciting initiative is our 180 degree from ordinary solution to add new capacity and major enhancements to the guest experience in a very time efficient manner. “The initiative not only creates beautiful new suites and public spaces, but we will also take the opportunity to re-engine the ships with a more fuel efficient and environmentally responsible propulsion system. The Million Star Plus Initiative will expand guest accommodation on the boutique line’s three all-suite vessels increasing capacity from 212 passengers to 312 guests per ship, following the lengthening. The work will be done to Star Breeze, Star Legend and Star Pride in succession between October 2019 and November 2020, and take place at the Fincantieri Shipyard in Palermo, Sicily, Italy. The project represents an overall capacity increase of 24% for the small ship line and is expected to be partially financed through an export credit facility guaranteed by SACE, Italy’s export credit agency. Each Star Class ship will be cut to allow the installation of a new section of ship that will lengthen each vessel approximately 25.6 metres bringing the total length to just over 138 metres, still the right size to access the smaller ports and harbors that Windstar favours on the line’s immersive itineraries. The project adds 50 new suites, bringing the total number of suites per ship to 156 and represents an investment of more than USD267,000 per passenger berth. “This major investment is an efficient way to build on a winning brand that shows strong momentum and growth potential,” said Xanterra Travel Collection President and CEO, Andrew N. Todd. Also involved in the USD250 Million Star Plus Initiative is the creation of state-of-the-art public spaces including two new dining locations; new shop and retail space; a much-enlarged fitness centre; and a new world-class spa. re-engine project for each ship. 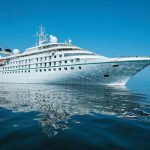 This complex undertaking is an uncommon occurrence in the cruise industry and involves the removal of seven current engines and installation of four new, more environmentally friendly engines that will run on cleaner fuel and reduce emissions impact to sailing regions. “Given our expertise as a leader in major cruise ship renovations and lengthening projects, we are gratified to be chosen by Windstar to undertake this complex and extensive endeavour,” said Fincantieri Services Executive SVP, Giorgio Rizzo. Windstar has partnered with acclaimed designer, Ray Chung, Director of Design at The Johnson Studio at Cooper Carry in New York, to create modern and inviting design aesthetics for the new public spaces and new suites. · 50 new suites featuring new suite categories and open floor plan configurations. a three-bedroom, two-balcony suite – the first of its kind in the cruise industry. Windstar’s Signature Onboard Barbecue celebration or enjoying while spending time on deck. · Larger pool and hot tub that will be reconfigured and elevated offering outstanding views, along with more and enhanced outdoor deck area for relaxing and sun-bathing. · A completely re-imagined and enlarged spa and fitness centre to invigorate active guests. · A new elevator mid-ship, making access to all decks easy from anywhere on board. that will ferry guests to port when ships are at anchor. In addition, ship staff and crew areas and accommodation will be expanded and upgraded. Additional crew will be hired and the increase will maintain the line’s impressive 1.5:1 guest to hotel staff ratio. As planning on the USD250 Million Star Plus Initiative progresses, additional details about the extensive work to be done, new onboard experiences, and new partnerships will be revealed and highlighted in news announcements and on a dedicated microsite that will launch in 2019.